Gibson RB-00 Model 5 String Banjo (1940), made in Kalamazoo, Michigan, serial # F559-1, sunburst lacquer finish, maple rim and resonatorn maple neck with rosewood fingerboard, period black hard shell case. Of all vintage fretted instruments, one of the hardest items to find is an authentic original prewar Gibson five-string banjo. The four-string tenor banjo was the most popular style in the 1920s and '30s by a wide margin, particularly among those who could afford pricey instruments like Gibsons! Most extant old Gibson five-strings are conversions from tenor or plectrum banjos and an original "5" in any style is always an exciting find. 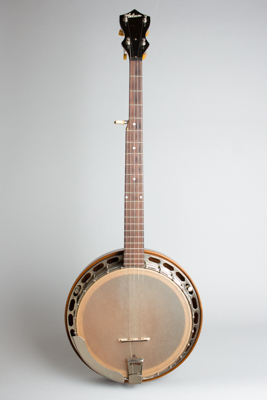 This instrument is an RB-00, the least expensive banjo in Gibson's line of the 1930s, but still a considerable rarity in the five-string configuration. These Style 00 banjos retailed originally at $30.00 and were available from the mid-'30s up until WWII. This one actually carries a serial number on the back of the headstock, so it is possible to date it fairly accurately to 1940. The features of these late pre-war banjos tend to be somewhat inconsistent as well, with different versions assembled from stocks of parts which may have been intended for other instruments originally! By the late 1930s banjos were no longer a priority for Gibson, and even well before WWII they often seem to have been put together somewhat randomly from whatever was available whenever an order came in. This one has a very small "Made in USA" stamped on the back of the headstock, an indication it was originally shipped outside the US, most likely to Canada. This RB-00's plain-finished rim is a thin 1/2" laminate peculiar to the 00 series, but still carrying the familiar cast one-piece Mastertone flange and a single coordinator rod/bolt neck attachment. There is no tone ring fitted and the hoop is fairly thin, while the hooks and armrest are standard Gibson fittings. The maple neck is sunburst finished on the back and has a pointed Kalamazoo-like headstock with a white script silkscreened Gibson logo on the black-painted face. The rosewood fingerboard is inlaid with single pearl dots (double at the 12th fret) and has no binding. The tuners are beautiful Art Deco Klusons with amber Catalin buttons -- unusually fancy for this model -- and the nut is plain ebony. Unlike the even cheaper Kalamazoo line banjos, this Gibson is equipped with both an adjustable truss rod and an arched-back resonator, which is bound only on the bottom edge. The back and sides feature a nicely shaded sunburst effect. The 00 style instruments were Gibson's attempt to make a "Genuine Gibson" available to anybody. For ambitious amateurs or hopeful entertainers on the way up, dropping $30.00 on a good instrument in the late 1930s was a real possibility. Despite this, the five-string banjo was not nearly as popular even in country music as it would later become, and relatively few of even these inexpensive banjos were made compared to guitars or even mandolins in the same price range. This banjo is an original 1930s Gibson, and even without a heavy tone ring or fancy trim is as authentic as one can get for pre-war banjo stylings. Perfect for any pre-Bluegrass string band or solo/duo playing with a surprisingly bright and powerful sound for a wood-top rim. Not a Mastertone, perhaps, but an instrument to reckon with nonetheless! Overall length is 37 1/2 in. (95.2 cm. ), 11 in. (27.9 cm.) diameter head. Scale length is 26 1/2 in. (673 mm.). Width of nut is 1 3/16 in. (30 mm.). A nicely original instrument overall, with some light wear and maintenance over the years. The neck has been refretted and the frets show just a bit of play wear. The all-important cast pre-war flange has a bit of typical warping, but no damage or deterioration other than surface pitting. The fifth string peg appears to be later, from the 1950s or '60s, and there is a small repair to the rosewood fingerboard above where it is mounted. A previous owner's name is neatly written inside the resonator. A very nice example, one of the few relatively affordable pre-war Gibson 5-string banjos in existence. Includes a period HSC that is a tight but functional fit. Excellent Condition.